It has been a wonderful summer and part of the Sesame Letterpress team (me) was lucky enough to spend a great deal of time in my lovely hometown of Marblehead, MA. 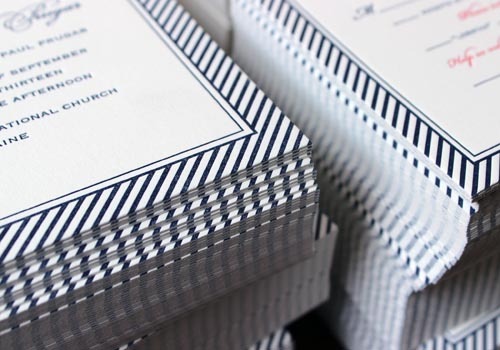 Swimming in saltwater, sailing, boating and eating a great deal of ice cream and lobster inspires the nautical themed stationery we love to print. It was therefore especially fun this summer to design this invitation stationery for a Maine wedding, in collaboration with a very sweet bride. We love the crisp navy stripes with the bright red accent type. We hope you have had a restful summer as well!